Primary production is the foundation for everything in the consumer arena. There is no other option. You can’t make something out of nothing. That is the lesson from nature and given that we ultimately are a part of nature, we are subject to the same rules. In a practical sense, what does this mean? Corals like this one, are symbiotic with algal cells inside their bodies, and they also eat plankton. Take the coral reef as an example. This is probably the single richest, most diverse, ecosystem in the underwater world. Yet they are all based in aquatic deserts. The waters are crystal clear because there is so little in them. Rich waters full of nutrients and plankton, are murky and coloured. Coral reefs have a huge organic matrix primarily made up of living coralline algae and coral, sponges, soft corals, and other living structures. It provides and amazing array of physical and biological niches for species to find ways to make a living. However, there is an important aspect of this wonderful place that is sometimes not well understood — and it is a perfect metaphor for some of the richest most diverse econosystems in the world as well. 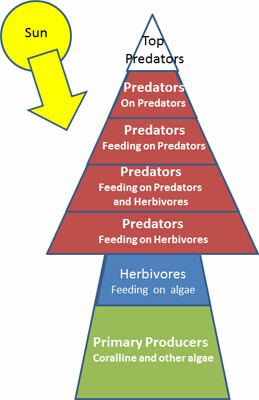 If we examine the trophic pyramid for a coral reef (here in very simplistic and diagrammatic form) we see a peculiar thing. The first diagram shows the contribution from primary producers using local resources. 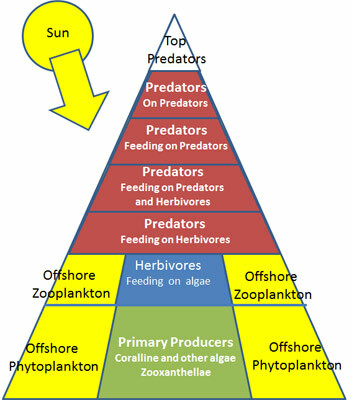 The second diagram demonstrates how the coral reef is able to build such a rich and diverse system on a foundation that is just plain and simple too small. The only way this can happen is to import from another ecosystem. In this case the ecosystem from which the coral reef imports the extra necessary materials is the open ocean in which it is located. The open ocean has constant currents that sweep over and around the coral reef. The reef is a virtual wall of mouths that faces these ocean currents. It includes corals, gorgonians, sponges, many small crustaceans, and small fish. The incoming currents, while not rich, have both plant plankton (phytoplankton) and animal plankton (zooplankton). The currents give up those riches to the coral reef, and that is the reason why the coral ecosystem can support many levels of consumers up to the top predators. It could not do it without the ocean currents. Guess what happens of the ocean currents stop? Not a pretty sight. Because the coral reef inhabitants are adapted for clear water and a constant but low supply of food and nutrients, they can handle variation, but if the ocean currents stop, there is no food for the wall of mouths and the sponges, corals, gorgonians, crustaceans and little fish die. 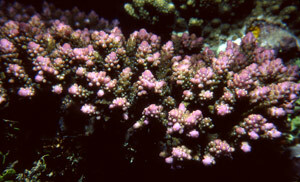 The coral skeletons become covered by pre-adapted algal species that were always on the reef, but in very low numbers. Take Dubai for example, it is an emirate in the United Arab Emirates. The city Dubai and the emirate suddenly jumped out of a poor economy to a very rich economy by relying on a single source of wealth — oil as a raw resource. For many years it built an infrastructure based on oil and its export to other areas, then it added infrastructure (very luxurious hotels) to attract business executives. The magnificent hotels also began to attract tourists, and today (2012), Dubai oil is only 6% of it revenue stream, almost all the rest is tourism. Tourism is like the ocean currents. Tourists blow in on the wings of the wind, drop their money and leave on the wings of the wind. They need the infrastructure (hotels and shopping malls), like the wall of mouths on the coral reef, but like the ocean currents, the tourists do not stay behind, they are just passing through. This is a tiny example of the unusual econome where the country is in the tropics, in an area of very poor cover and agriculture (a desert environment), and yet is wealthy. Most remain poor. The key to the success here is that the country had a brief shot at using a single source of energy to build suitable infrastructure to attract tourists. It did not succumb to scammer systems to sell its raw resources without building an infrastructure. As long as the tourists keep coming and the infrastructure remains in place, just like the coral reef, as long as the currents keep coming and the wall of mouths stays intact, the two systems (eco and econo) will be fine. If the ocean currents slow, the reefs suffer, just like the economy of Dubai will suffer. In both cases, the stability of the system relies on an external supply of resources over which it has no control.